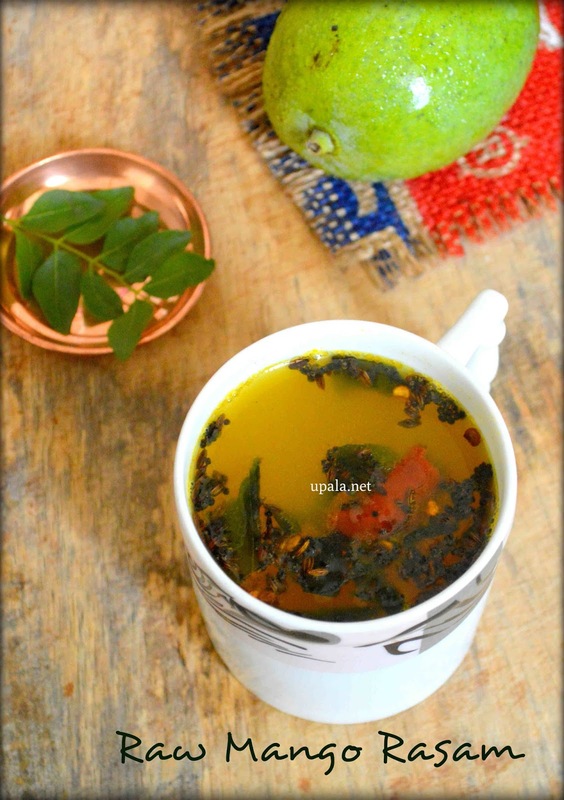 Raw mango Rasam/Maavinakayi Appe huli Saaru is a yummy Rasam prepared with Raw mangoes. During season, we get plenty of raw mangoes and we include mangoes in almost all recipes. Now we are going to see the Raw mango rasam recipe, this rasam is little different from normal rasam which we make out of tamarind. It has distinct mango flavour and the jaggery added to it is enhancing it further. Give it a try before the season ends. 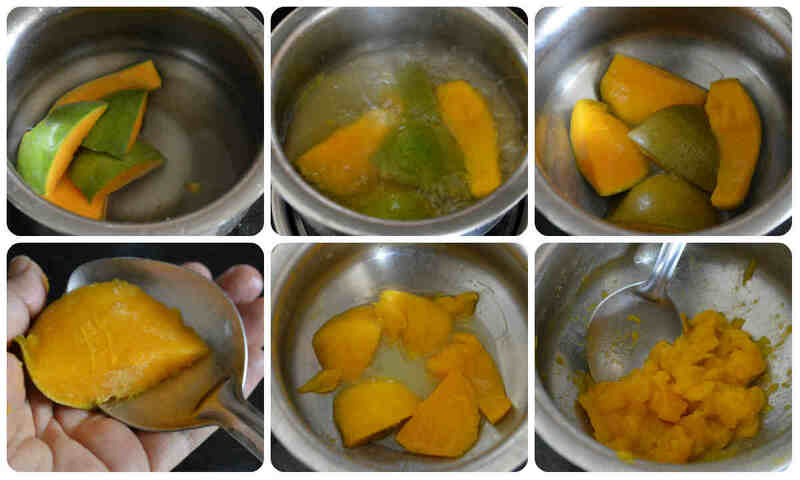 1) Chop the raw mango into big pieces and discard the seed inside. Add little water to cover the pieces and boil them. 2) After the raw mangoes are cooked, scoop out the pulp portion and discard the skin. 3) Mash them with the back side of the ladle or you can grind it in a mixer. 4) Add enough water and start boiling it. Next add turmeric powder, Hing, green chilli, salt and leave it to boil for 10 minutes. 5) Now, add jaggery and leave it to boil for few more minutes. 6) Heat ghee in a kadai, add mustard seeds and cumin seeds to crackle. Next add red chillies and curry leaves, give a quick fry and switch off the flame. 7) Pour this seasoning mixture on top of the rasam. Yummy Raw mango rasam is ready. 1) This rasam tastes better when you use a sour variety. The more sour it is, more tastier the rasam will be. If in case the sour taste is not coming out well, you can add 2 tsp of Lemon juice at the final stage. 2) You can add 1 tsp of rasam powder, if you don't like it plain. 3) You can add few finely chopped coriander finally. 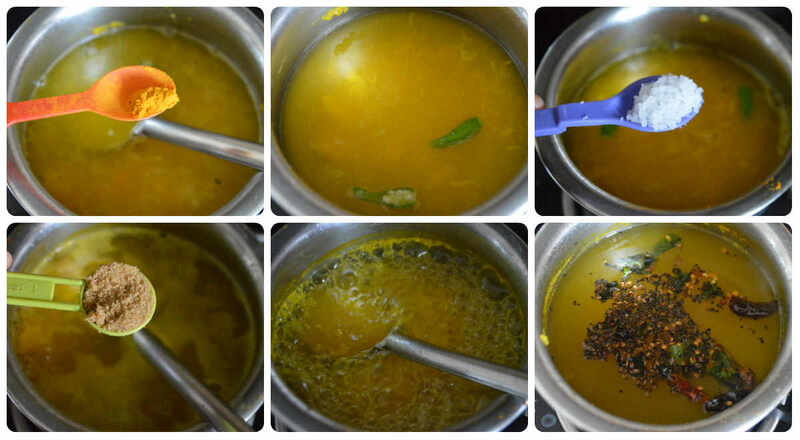 4) If you want to make it as a mango dal rasam, cook a ladle of toor dal and add it to rasam.